Clear Creek starts its steep descent of the Rocky Mountains at the nearby Continental Divide. With a gradient that averages some 67 feet per mile, a Clear Creek raft trip has more rapids in its relatively short length than many other rivers in Colorado. 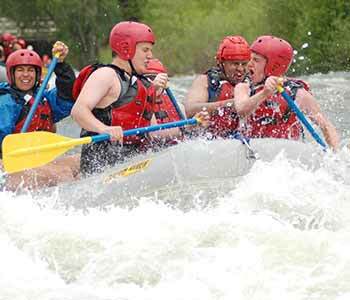 Located near Idaho Springs, Colorado, just a few minutes from Geo’s Morrison base, Clear Creek is the closest “true” whitewater rafting to Denver. Clear Creek offers bodacious FUN and you don’t have to commit an entire day. 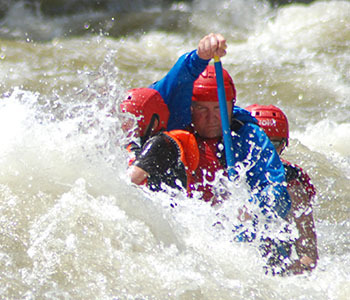 Geo offers Part-Day and Full-Day raft trips with a section to suit everyone from the Beginner to the Advanced rafter. Take advantage of Geo’s experience and expertise and let us plan the perfect trip on Clear Creek for your whole group’s technical ability. 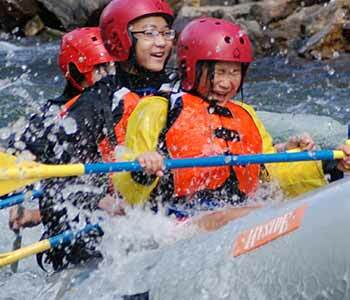 Prices include any meals, rafting equipment, spray jackets, helmets, PFDs and of course, guides. Geo Tours has wetsuits & boots available for rent. Geo Tours can customize your raft trip, call for more information. ALWAYS FREE TRANSPORTATION from Geo Tours’ base in Morrison to and from Clear Creek! 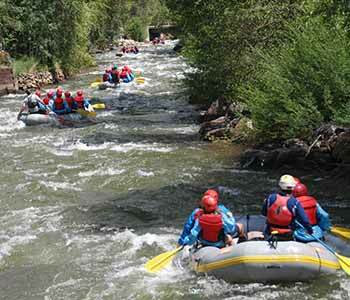 Geo Tours’ Mountain Lion trip on Clear Creek is perfect for first time paddlers. The action picks up with Castle Falls, Subway Rapid, the Argo Holes and Dizzy Lizzy Rapid (just to highlight a few) and then continues through the finale at Twister Rapid. (Class -III – MINIMUM AGE: 7 years*). For those interested in more thrills, ask us about our Mountain Lion Plus trip. Plus trip adds an additional mile of Clear Creek beyond the Kermit’s Takeout and Upper Beaver Falls and Lower Beaver Falls rapids. (Class IV – MINIMUM AGE: 16 years*). All trips on Clear Creek include helmets. NOTE: Regular Schedule meet times are 8:00 AM and 12:00 Noon. Alternate meet times (10:00 AM and 2:00 PM) may sometimes be arranged for large groups under special circumstances upon approval of the management. Upon request alternate times may be available for large groups. Call: 800-660-7238 for details or to book this trip. The Outer Limits trip starts right-off with serious Class IV whitewater when (just to name a few) you challenge Nomad Rapid, Fall River Rapid, the Phoenix Holes, Deliverance Rapid and the awesome Outer Limits Rapid. Prior paddling experience, good swimming ability and wetsuits are required. All trips on Clear Creek include helmets. NOTE: Regular Schedule meet times are 8:00 AM and 12:00 Noon. Alternate meet times (10:00 AM and 2:00 PM) may sometimes be arranged for large groups under special circumstances upon approval of the management. On the Terminator section you’ll take on the Lower Canyon of Clear Creek after warming-up on the “easy” section. The Lower Canyon features Class IV rapids such as Beaver Falls, Ejector, Double Knife, Hell’s Corner and Terminator all at a nearly non-stop pace. Prior paddling experience, good swimming ability and wetsuits are required. All trips on Clear Creek include helmets. NOTE: Regular Schedule meet times are 8:00 AM and 12:00 Noon. Alternate meet times (10:00 AM and 2:00 PM) may sometimes be arranged for large groups under special circumstances upon approval of the management. Run the Mountain Lion section in the morning and then following a riverside lunch you will raft the Outer Limits section. Available upon request with a 6 guests minimum. All trips on Clear Creek include helmets.